A friend and I went on a short yarn crawl Wednesday afternoon, intending to hit one yarn store in search of bobbins for our bobbin lace class. We were out of luck with that, but I remembered there was a second store close by that I'd visited only once before. Pearl's Knitting Parlor in Thousand Oaks is a small shop, with elegant decor and a very nice selection of yarn and buttons. And they had just put some of their very nice yarns on sale for 50 or 75% off. Under the circumstances, I think I behaved very well. I came home with only one bag of yarn- a very big bag, but still only one. But I had to share the news, right? Oh, yeah. Another friend and I went back Thursday (hey, I didn't have the heart to make her go by herself. I was being selfless; only doing my civic duty.) 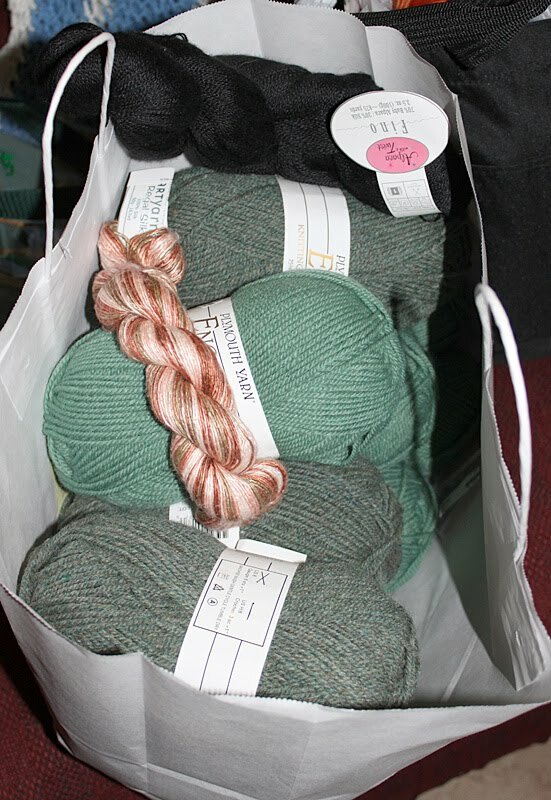 And I came home with this - one more big bag of yarn. So what did I get? Day 1 - 6 balls on Plymouth 'Encore' (1200 yards) to make Marie a baby blanket; 5 balls on 'Encore' (1000 yards), in a butterscotch/pumpkin color, to make me a sweater; and 5 balls (510 yards) of Royal Llama Silk - in a pumpkin tweedy color - to make a shawl. Grand total? $31!! The Encore alone would normally be over $66. Day 2's haul - 10 balls (2000 yards) of 'Encore' in two shades of green that I hope Rach will like as an afghan; 875 yards of black lace-weight baby alpaca and silk, which will probably become another gifted shawl (Rachel? you interested? maybe with small black beads? ); and my favorite - Artyarn's 'Regal Silk', 163 yards of pure silk goodness that will become a small scarf for me. And today's total? $34! 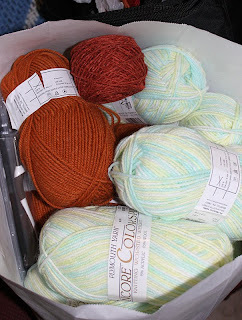 Whoohoo for yarn sales and my great local yarn shops! Nice! I love me a yarngain. Yeah, I'm making up words, so what? I will take a beaded one for sure!